The advice everyone gives about how to deal with a bully is wrong. There. I said it. Someone had to. 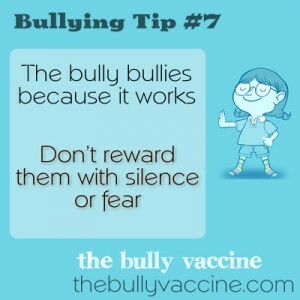 To get a bully to stop you need to remove their reward. You don’t do that by ignoring them. The challenge is in figuring out how a bully is rewarded and that depends entirely on the bully. Fortunately, there are a few patterns that bullies fall into. Sometimes they do it because they are insecure. Sometimes they like to see other people get upset. Sometimes they are just trying to show that they can dominate another person. Sometimes they just want your attention. In all these cases, ignoring a bully will actually reward them. By not engaging, you are signaling submission. What you want to show them and their audience is that you are not afraid or upset by them and that you are not submissive to them. Ignoring them may work well for online trolls, but it will not work well when the bully is bullying you to your face and in front of other people. So what should you do if you don’t ignore them? Glad you asked. You need to respond in a way that demonstrates 3 things. 1) That you are not afraid of them. 2) that what they did was not ok. And 3) that the other people watching, should look down on the bully’s behavior. You do this by standing up to them. But what exactly does that mean? It means looking them in the eye and responding to them verbally to signal that you aren’t afraid or bothered and that they aren’t going to be able to control you. What you say isn’t that important except that it has to be basically polite and not rude. What is more important is how you say it. Body language. Look them in the eye (or as close as you can get). You will need to practice this with a friend or a parent to be able to do it. Practice making eye contact, saying your chosen phrase. And then wait. You are basically going to stare them down and wait for them to disengage. Note: don’t do this if what is happening is violent or physical. If it is violent or physical, get away, then report. What generally happens is that they try again to insult you. You respond in the exact same way. They get more confused and try again. You respond in the exact same way, then they come up with an excuse to disengage from you. They may insult you to justify you not being worth their time. That’s fine. What matters is that they are the ones to disengage. Repeat this process as necessary and they will eventually find you not worth their time to hassle. If the bullying is chronic and ongoing, then document every incident and start reporting what is going on – every time. This will help increase the cost of the bullying behavior and decrease the reward. If they can’t pressure you into not reporting them, they lose. So – report. To learn more about how to use operant conditioning techniques to stop bullying, get my book and join this site and view the videos available here.